Dr Brian Lerner is stressed out and fed up with the problems at his dental office. The constant staff problems and canceled appointments are a far cry from the successful, patient-centered practice he had dreamed of when he graduated from dental school. His friend, Dr Joe Armstrong, is not faring much better—in fact, his practice problems have escalated to the point of threatening his once stable and loving marriage. Determined to turn their lives around, Brian calls their mutual friend and highly successful dentist, Dr Richard Small. Rich helps them see through the distractions of their myriad daily problems to discover the few key root causes of difficulty in their practice and keeps them on track as they address these problems in the face of staff resistance and their own reluctance to change. Brian and Joe both enjoy some immediate relief of stress and improvement in their practice, then continue to reach new heights of success as Rich teaches them sales and marketing strategies to help them do more of the work they love; scheduling techniques that benefit both the practice and the patients; people management skills that improve their relationship with their staff; and quality control measures that reduce waste and enhance their patient care. 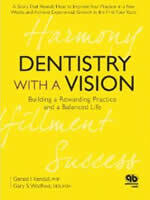 With the help of their friend and their wives, these two dentists discover that the dream of a successful and rewarding practice can become a reality.